NOTE: All previous Certified Life Coach Programs were sold out 3 weeks in advance! Do people usually come to you for advice? Do you see potential in people and become frustrated when they don’t meet that potential? Do you value personal growth? Are you looking for a career full of personal and financial freedom? Do you want to add International Credentials to your resume? If you answered yes to any of the above questions, then this journey is for you! Imagine having a booming and fulfilling career, doing what you love and helping others to improve their lives. 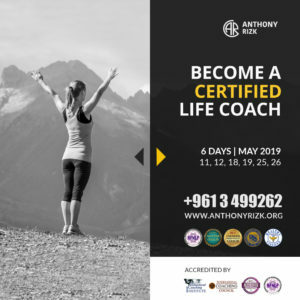 Whether you feel that you may want to have a career in coaching, or you may want to use the revolutionary techniques for your own breakthrough, by becoming a Certified Life Coach, you can help the people and organizations you’re most passionate about and even yourself to overcome challenges and achieve lasting results. Being part of the Certified Life Coach Program, your job is to help your clients unlock their potential to be their absolute best. You can create empowering and change in individuals and organizations, whilst building a highly satisfying career. Life Coaching is a $2 billion industry and growing geometrically. As a Certified Life Coach, you’ll be your own boss. This means you can set your own schedule and have unlimited earning potential. You can take home a solid income, and have more time for the things that are important to you to lead the life that you deserve. – We are so confident in our Certified Life Coach Program, in the life changing skills you’ll learn, and that you’ll be an exceptional Life Coach after completion, that we start referring clients to you immediately! PS: All applicants will be asked for an interview with Master Coach Anthony Rizk to determine eligibility to attend. "This course was highly beneficial and fulfilling. It really fed me a lot of knowledge for personal growth and to help others that are truly hungry to grow and improve." This course added a lot of knowledge and value to me. I learned a lot theoretically and way more practically. This is why I highly recommend it to everyone! It was a joy to attend this training. It was an eye opener for me to see life in a different way. Thank you Anthony! One of the most inspiring courses in my life. Love it! It changed my life! Very intense and inspiring. Helped me rediscover hidden parts of myself. Looking forward to pass on this service to others. This course is fantastic. it is a life changing experience. If you want to change your life and not be average, take this course! The added value you earn from this course is super self motivational and beneficial. Anthony is just an amazing person and brilliant coach. I loved this course. Thank you Anthony really. You are so… I don’t have words to say. This course changed something in me definitely and in my life. Thank you. This wasn’t just a course, it was a life changing experience. Coach Anthony you gave us what we couldn’t find in book. Best coach ever 🙂 Love you and will miss you. It is a turn over in my life. This course give us another goal, another meaning, another insight to our lives. I simply changed to become a better version of myself. All the respect for a coach who gives everything from his heart. It’s really impressing how your passion shows in every word you say and every course you explain. Coach Anthony is the best. He made us feel like we’re in an outing and just talking, while getting to do the best thing ever, which is being able to help others.